Oh yes please, give me pizza, we love pizza! We seem to be making pizza a lot, when I say a lot, I mean about three times a month. So I am going to share our dough recipe with you. Pizza equals happy. The smell of the yeast, the feel of the dough, and of course the eating part. I love the simple science of making dough, how kneading the yeast, water and flour activates the gluten and changes the lump of goo into a living growing thing. 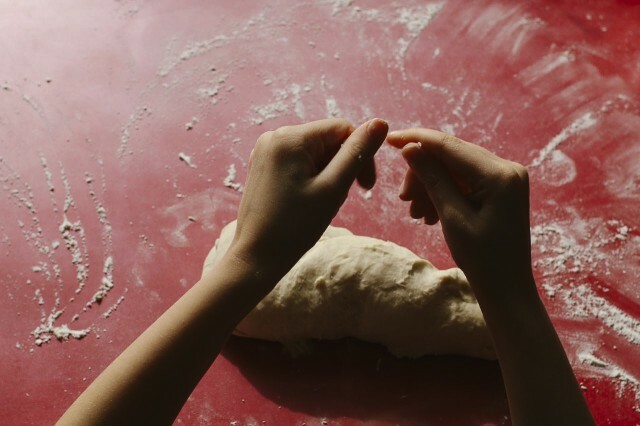 That feeling of being connected to the dough and like magic it starts to have ‘body’ and feels elastic and alive. 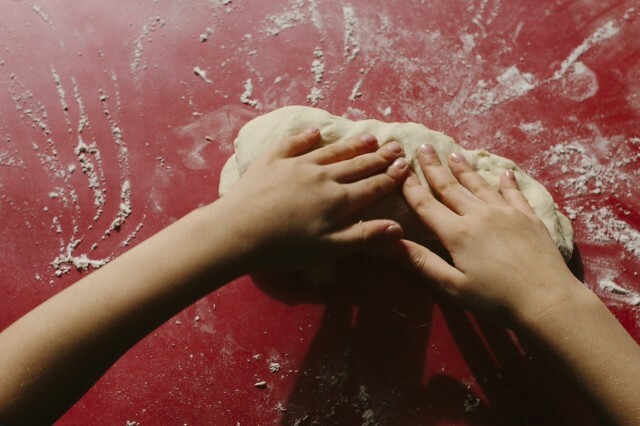 I also love how the simple act of making dough brings out the creativity in the girls… you just never know what dough sculpture they will make next. I have not always made pizza dough, in my younger years I was intimidated by making bread. Thank goodness I got over that because homemade pizza is one of the joys of life. 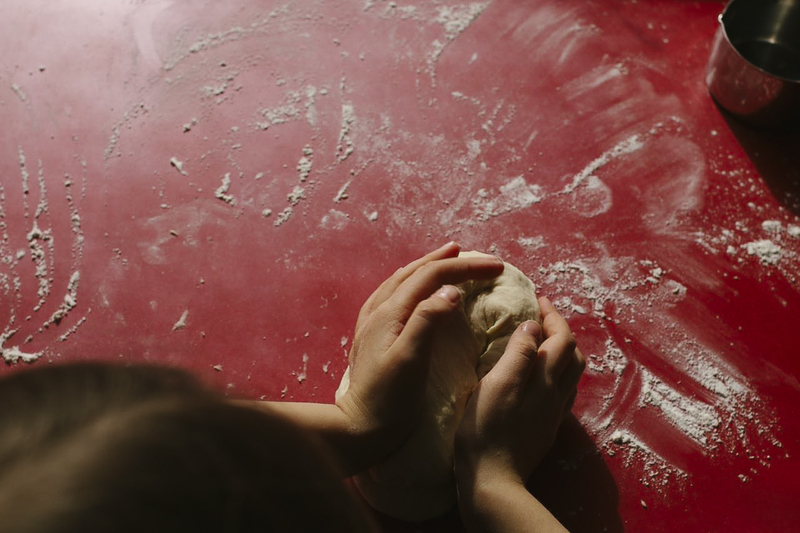 If Maya and Elle can leave home and know how to make bread and pizza dough, I will feel like I have done a good job. extra 1/2 cup of flour for kneading. Combine the yeast and the warm water in a large bowl. Stir with metal spoon or whisk until yeast is dissolved. Add in the rest of the ingredients. Mix with a wooden spoon until it is holding together. If it is too wet add another tablespoon of flour. Turn dough onto lightly floured surface and knead for 10 minutes, adding more flour if needed. Enjoy the kneading. This is the best part. Knead, knead, knead. The dough should be smooth and elastic, tacky, not sticky. When you are done it should have a resilient texture. Place it into a bowl that you’ve lightly coated with additional olive oil. Roll the dough over to coat completely in oil. Cover with a dish towel and let rise in a warm place. I like to put mine on top of our radiator. Or in a sunny spot. You can also put it in the oven which has been preheated for about 10 minutes (then turned off). Rise the dough until it has doubled in volume. Once the dough has risen to twice the original size, it is ready. This takes 60-90 minutes. Punch the dough down. At this point you can use all the dough to make one large pizza, or two smaller pizzas. You can use one half and refrigerate the other half for tomorrow. Pre-heat the oven to 425˚F. Dust your pizza tray with cornmeal (don’t skip this step) and prepare the topping ingredients. Once you have your toppings prepared, flatten the dough onto the baking tray. I find the dough very elastic and I am not good a dough twirling (although I have tried!) so I use a rolling pin to help press it very thin, you can also just press it with your hands, but we like a thin crust so I resort to the rolling-pin. I top ours in organic tomato puree, straight from the can, fresh herds, usually oregano, basil or thyme. I then add whatever we happen to have in the fridge. A complimentary combination of some of the following: Spinach, sweet potato, capsicum, kale, eggplant, roasted tomatoes, olives… there really are so many options with pizza! I always try to pack on the green veggies. I generally use two to three different types of cheese: mozzarella, feta, jack, cheddar and always fresh grated reggiano. Once the toppings are on it goes straight into the preheated oven. I cook our for about 15 minutes. It seems to cook quickly because the crust is thin. We like the bottom to be a little crispy and golden. This entry was posted in E A T and tagged cook, dough, eat, pizza. We use the idenitical recipe! We stumbled upon it once when searching for a simple vegan dough — although, yes, most basic breads are vegan anyway. 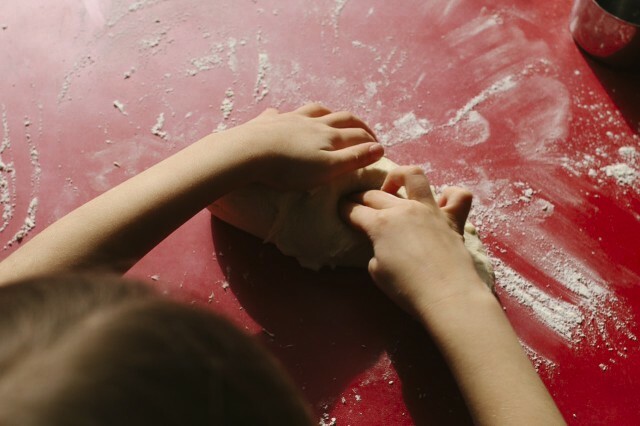 The trouble is always convincing the children that the dough has been kneaded enough…because you know they don’t want to stop playing with it. Thanks for sharing your recipe. Have you ever baked your pizzas in the barbeque?? Oh my. It adds such an amazing smokey taste! No, I have not tried that. We don’t have a BBQ… we aren’t meet eaters…course you can cook lots of things on a BBQ, and it is nice to cook outside! Thanks for the idea!